The Roll of Honor that listed burials at Salisbury also listed the cause of death for most of the prisoners that died at Salisbury. The causes of death had to have been taken from the hospital records at Salisbury. 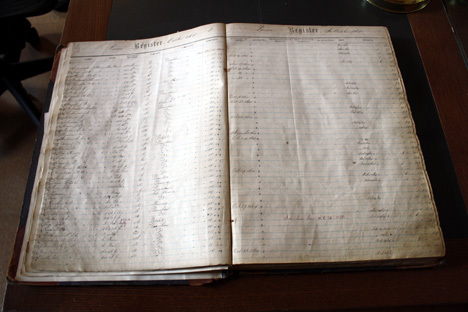 However I could not locate the hospital register at the National Archives. Because the Department of Veterans Affairs researcher’s “considerable expenditure of time” did not locate the hospital records I concluded that they had been destroyed after the Roll of Honor was published. Fortunately the National Archives has greatly expanded the database of their holdings. 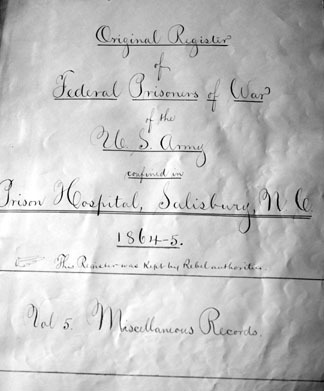 I located the missing Salisbury Hospital Register in the records of Records of the Commissary General of Prisoners. In August 2010 I visited the Archives and located the records. After I located the records at the Archives one archivist told me: “The records of prison camps were stripped from the captured Confederate records and sent to the Commissary General of Prisoners.” The archivists I spoke with on my earlier research trips apparently did not know this. This register lists the names of soldiers that died in the Salisbury hospital. A historian could use this register, the Roll of Honor, and other records from the National Archives to determine the names of the soldiers buried at Salisbury. It is time to identify these soldiers and mark their graves.